If you have been working from home, it would be more than a luxury to opt for the spill-resistant keyboards. It should also be an essential option to go for the spill-resistant keyboards if you the habit of drinking or snacking while you are deeply engrossed in gaming or working on your computers. Spill-resistant keyboards are designed to keep away the fear of damage to the functionality of the keyboard from liquid spills or other foreign objects. Before we can dwell upon the best spill-proof keyboards you can lay your hands on, how about checking out and understanding what exactly an IP Rating is? So, what is the IP rating and how does it define the spill proof nature of a given keyboard? IP stands for Ingress Protection. This is a measure of the sealing properties of the enclosures for the electronic parts. The rating measures the capacity of the sealing to restrict inclusion of foreign bodies like tools, dirt, and moisture. IP Rating has two digits. The first digit stands for Ingress protection against the solids. The digit 0 should indicate no protection against dust particles and contact. The number 6 will mean the complete protection against the dust particles. The second digit, on the other hand, is indicative of protection against liquid protection. Once again digit ‘0’ indicates no protection while number 8 indicates complete protection against water particles. For instance, a standard of IP68 should be the highest standard for protection against both dust and water. Having understood the IP rating and what it means, how about checking out the best keyboards with an IP54 rating that you can opt for? Of course, when it comes to IP rating, several keyboards offer you various IP ratings like IP67 or IP68. Choosing an IP54 Spill-resistant keyboard may not be that easy given the fact that there are not many options currently available. While the spill-resistant keyboards help you avoid the extensive damage caused by the liquid spills, it is advisable to get your keyboard checked if you find any liquid spill on your keyboard. Spill-resistant keyboards can prevent immediate damage, but getting it cleaned would be a wise option in case you have a severe spill on the keyboard. Specifically designed for the gaming enthusiasts, the Razer BlackWidow Ultimate keyboard offers you a blazing faster performance. The keyboard console comes with IP54 ratings for enhanced performance. It comes with Razer mechanical switches for providing you a superb functionality and durability. Water and dust resistance tested for up to IP54 standards. Designed for providing you excellent durability with a life span of up to 80 million keystrokes. The 10 key rollover ensures that your keystrokes are correctly registered. A smarter design with customized lighting performance. The keyboard does not present many innovative features. If those features interest you, visit this link on Amazon for more details. The Cherry G86-52400 is a compact keyboard that offers you a heavy duty functionality. What should make it an excellent option is its dust and a waterproof feature that should make it a great choice to go with. The durable design promises up to 25 million keystrokes during its lifetime. Cherry compact keyboard comes with an IP54 dust and water resistance properties. The keyboard provides you a plug and plays compatibility with a USB connection. High level of reliability and reduced maintenance. Old Model and it may not be available in certain markets. If you like the keyboard and its features, you can check it out here on Amazon. Another offering from Cherry, this full-size keyboard also comes with IP54 dust and waterproof design. One of the best options for the harsh environments, you can ensure durable workability with these keyboards. If you think it is worth the investment, you can find more about the keyboard on Amazon. 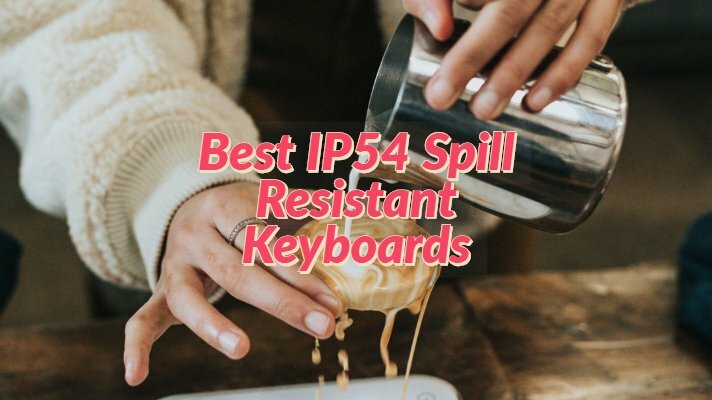 Those were a few options we have among the best spill resistant keyboards, but there are not many options in the IP54 rating apart from a few we have listed above. We thought of sharing a few other options available under the spill-resistant keyboards for access to the best spill-proof functionality. Here are a few special mentions for your needs in spill resistant keyboards. It is one of the excellent real-life experiences for your gaming or working. It offers you strong, durable design elements and resists the liquid spills and has been tested with liquid spills up to 60 ml. The keyboard offers you a slimmer gaming functionality. The keyboard also offers you excellent personalization and customization options. It provides you a performance four times faster than the standard keyboards. 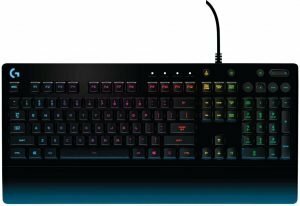 A color illumination is an attractive option that the Logitech G213 offers you. You have access to easy customized key lighting options and 12 function keys with the custom commands. It protects you from crumbs and dirt. If you think you have to go with the keyboard and its exciting features, you can opt for it on Amazon. It offers you an IP67 waterproof and spill resistant functionality. 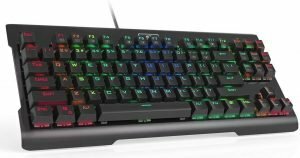 The Redragon K561 VISNU keyboard offers you a mechanical keyboard functionality. The keyboard offers you a faster ultra responsive design and provides you with tactile feedback. The keyboard comes with the aircraft grade Aluminium construction, and it provides you with a more stringent industrial application. If you are into gaming, you will indeed love the multiple themes available. If you find it interesting enough, you can check out more features here on Amazon. The antimicrobial and medical grade construction should be helpful enough for an enhanced experience of washable keyboards. The IP67 grade waterproof features should make it a good option for the spill-resistant keyboard. The keyboard also comes with an integrated touchpad that can be used instead of a mouse. The hotkeys for internet and multimedia should be helpful enough for enhanced performance. Wrapped with silicone material, it should offer you an excellent option to work in areas prone to liquid spills. Quieter membrane keys for enhanced performance. The USB interface provides you an easy connectivity option. With washable design, it offers you practical and hygienic conditions. 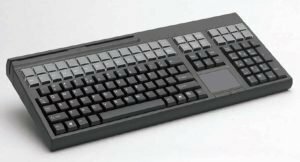 Those were the best spill resistant keyboards we could list out for trouble-free performance, especially when you are one of those who likes munching on something while working on your computer or even while gaming. Though an IP rating of IP54 should be enough for a washable application, we found a good list of keyboards that offer you an extra layer of security with IP67 or IP68 waterproof rating. Meanwhile, an IP rating above 54 will ensure that your keyboard stays safe from the dust ingress as well. Have you used any of the keyboards we have featured in the above compilation of the best spill resistant options currently available? Do share your experiences and opinions concerning the features of these keyboards. If you have used any good spill resistant keyboards other than the ones outlined here, you may share them as well with us.